Pub Crawl is the newer, better version of Let The Words Flow, and it’s launching today! It’s Pub[lishing] Crawl, or Pub Crawl for short. 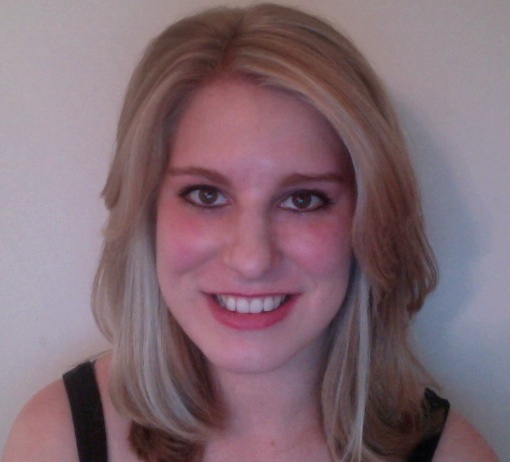 The site was custom built by Susan Dennard and one of our exciting new members! As stated above, we have exciting new members! Lots of them in fact! Supremely awesome, accomplished, kickass new members! We’ll be announcing a new one almost every day for the next two weeks! The LTWF site will stay up, but we won’t be updating it anymore. We’ve been planning this for MONTHS and are so incredibly excited to finally get to share it with you! Please come and check it out! As I mentioned previously, I spent last week with Sarah Maas, Susan Dennard, Kat Zhang, and Biljana Likic from Let The Words Flow! The trip was amazing. We stayed at this awesome beach house right on the coast, went to Harry Potter World in Orlando, and even met up with a fan of the blog for lunch/book shopping! You can see all the pictures from the trip here on my Facebook. The most amazing part was how we managed to spend 6 days together and not run out of stuff to talk about as it relates to writing. From the projects we’re working on to anecdotes about querying and publishing, I learned sooo much and felt so grateful to be privy to this wisdom. However, the trip was fraught with some weird bad luck. First Biljana’s plane got delayed and she almost had to spend the night in Atlanta (having done this before, let me say it’s airport hell on earth), then a ride broke down at HP world, Billy got stung by a jellyfish, and I realized I’d left my laptop and reading material at Susan’s house (not to mention the van broke down as we were trying to get home). Cue gasp of horror. I’ve never been on vacation without something to read, or at least something to write on. Thankfully, after lunch with our fan, Sydney, we went to a Barnes & Noble and I was able to buy a notebook, which I quickly filled with 2,000 words of the zombie novel. A snapshot of how crazily I filled this notebook. A page was about 250 words… that’s a lot of pages! I know I said I had to put it aside, but I’m in this weird limbo right now where I can’t work on anything else so I might as well write on the zombie book since I know I want to sell it eventually. Just in case anyone was wondering… Harry Potter world was awesome! They have a village set up just like Hogsmeade. We all got butterbeer (it was disgusting), and waited in line for 2 hours just to ride the Hogwarts Adventure ride. It was worth it, though I wouldn’t do it again. We were literally dripping with sweat and in the longest line I have ever seen in my life. Later we discovered we are all screamers as we went on a log ride that left us absolutely soaked, then on a dragon roller coaster that left us all with headaches and sore voices. But that didn’t stop Billy, Susan, and I from riding the Hulk, where we screamed so loud Sarah and Kat on the ground knew which coaster was ours. Here’s the girls with our fan (I was taking the picture). 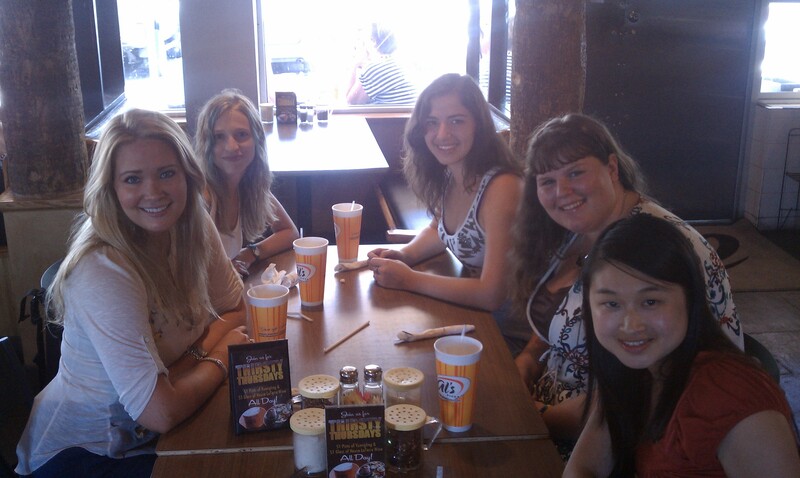 From left to right: Sarah Maas, Susan Dennard, Biljana Likic, Sydney, Kat Zhang. Here’s all of us taking a picture with Mandy Hubbard’s newest release, RIPPLE! But on the other hand, I really missed Chris and wanted to come home and be with him and get back on a regular writing schedule again (with my beloved laptop). Also, I have a really funny Teaser Tuesday to share with you all, so tune in next week to read the first fantasy story I ever wrote! Today I posted the following article over at Let The Words Flow. My question to you guys is… do you keep up with LTWF, or should I start cross-posting all my articles to this blog as well? Live Chat at LTWF Tonight! Let the Words Flow will be hosting a chat tonight at 9 EST. The topic will be ‘getting to know the LTWF girls’, in honor of the fact that we are accepting applications for membership! You can visit the chat through this link. I will be there, making bad jokes and liking things that no one else does, so come say hi! My article entitled ‘Sudden Novel Death Syndrome’ is up at Let The Words Flow. Read about three more problems and their solutions at Let The Words Flow!